Take pleasure in the lavish festive buffet of international culinary fare in a friendly setting. The fresh harvest from the sea coupled with the soothing sound of the waves promises a romantic dinner affair. Indulge in an Italian fare and extensive beverage list. Mark the occasion with a five-course menu and selection of fine wines. The four-course menu with a north African influence makes for a unique dining experience. From starters to desserts, take part of the hearty celebrations and joyful gathering in the hotel’s buffet restaurants. The bountiful spread of international favourites includes traditional roast turkey, seafood station, carving station and sensational sweets. Usher in the New Year with a gastronomic celebration. A four-course dinner will be served in at Tapas at Al Bandar hotel from 8 to 10:30 p.m. Arabic, vegetarian and children’s menu options is also available. The set dinner with a selection of beverages is priced at OMR 98.000* per person. Children from six to 12 years old enjoy a 50% discount. After dinner, the revelry continues with a countdown at Turtle Beach. Australia’s most versatile band, Big City Beat, is sure to set the mood to celebrate the coming of the New Year. Party on with a cheese buffet and free-flowing beverages. 11.30 p.m. to 2:30 a.m.
Based in Melbourne, Australia, Big City Beat performs across the world with shows that embrace all ages and culture. Having a well-received performance last year during the New Year’s Eve countdown, the group was engaged again this year during the occasion. The 11-piece showband with commanding presence on stage will render an impressive repertoire of party favourites, popular rock classics and today’s top 40 hits. Start the year with a bountiful gastronomic indulgence at the resort’s two buffet restaurants. Well, RO 98 for the NYE bash, I think that's the most expensive event of the lot, and I'm sure it'll be excellent. Featuring Matthew Charles, who has had residencies at both Trilogy and 360 in Dubai, as well as Cafe Mambo in Ibiza, and regular slots at Pacha. So he's not a no-body, and will be worth seeing, even though he is, unfortunately, Scottish. We can't all be perfect. 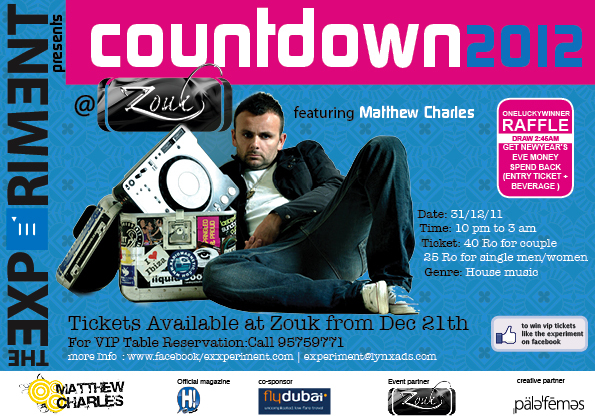 Tickets are on sale now at Zouk, and cost RO 25 per person, or RO 40 for a couple. Drinks are extra, but you get one with the cost of your ticket, and also a free drink at midnight. More coming soon! Have a great weekend. Obviously the Scottish contingent in Oman is far too busy to react to such 'jock'ularisations! Well done you lot.